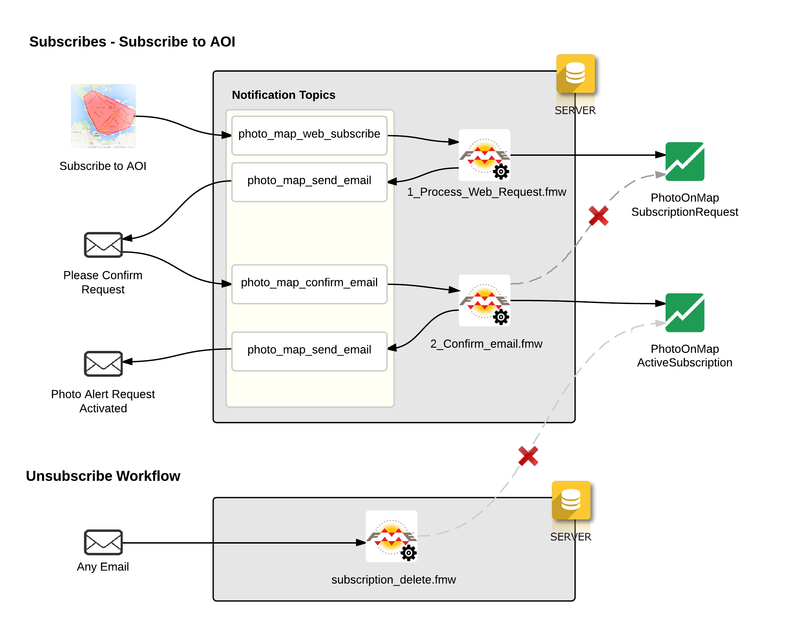 This demo takes the Take a photo, email it to FME Server and put it on the map demo and merges it with the Notification Services based on the Subscription Model demo. It is attempting to take the notification framework that was created in the second demo and apply a real-life scenario. Take a photo with a GPS enabled smartphone, and send it to photo@demos-safe-software.fmecloud.com. If the photo is located within the AOI you subscribed to, you will receive an email back with a Google static map and a link to a map which shows the location of your photo. User subscribes to an area of interest (AOI) for a defined period of time. 1_Process_Web_Request.fmw workspace processes the contents of the request and loads the data into the PhotoOnMapSubscriptionRequest Google Fusion table. The workspace also sends an email back to the user asking them to confirm that they did mean to subscribe on this email address (a security measure as otherwise people could sign anyone up). The user confirms the subscription on this email by simply replying to the email. 2_Confirm_email.fmw workspace runs which removes the user from the PhotoOnMapSubscriptionRequest table and enters them into the PhotoOnMapActiveSubscription table. It also sends an email confirming that their subscription is active. At any point the user can click on an unsubscribe link in any of the emails which runs the subscription_delete.fmw workspace and removes the user from the PhotoOnMapActiveSubscription table. The 3_report_photo.fmw workspace is subscribed to that topic and it runs reading in the contents of the email. The workspace extracts meta data from the photo including the location, rotates it if required, and then loads the data into the PhotoOnMapPhotoLibrary Google Fusion Table. 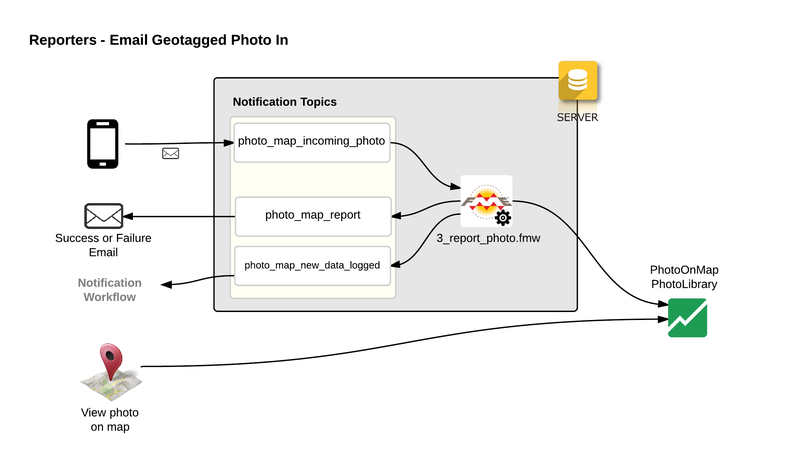 The workspace also sends a message to the photo_map_new_data_logged topic which triggers the notification workflow outlined below. Whenever a new photo is emailed in this workflow is triggered. The 4_notification_alert_generation.fmw workspace reads in the location of the photo and which user triggered it. A static map is created showing the location of the photo and a SpatialFilter evaluates whether the photo lies within a subscriber's AOI. If it does the subscriber is looked up and an email is sent to them using the notification server. photo_map_web_subscribe Called when the user first sets up a subscription. photo_map_send_email Topic is for the output emailer. This is only for email. photo_map_confirm_email Called when the user confirms the subscription via email. photo-map-send-email-activated Triggers email to indicate that subscription is activated. photo_map_new_data_logged Published to when any new photos enter the system. photo-map-notification-alert Sends a notification email out to subscribers. Creates an email address that is used by customers to confirm they want to subscribe to the service. Creates an email address that is used by customers to send photos into FME Server to be displayed on the map. At several points in this demo we use FME Workbench to send emails out via the notification service. This subscription sets up a template with account details that can be used to send emails with different content. Description: Called after the user completes the web form and subscribes to an AOI to receive notifications. Description: Called after the user replies to the confirmation email and subscribes to receive notifications. Description: Called when the user emails in a photo to add to the map. Description: Called once a photo has been successfully processed and written to the database. Responsible for sending a notification out to any subscribers that have registered to receive notifications for that area. Description: Called when a subscriber chooses to unsubscribe. Removes the subscriber from all DB tables.